For his debut album “Keep It Raw” Jazz&Milk labelfounder Dusty has invited several jazz musicians into the studio including the great voice of “Carla Vallet”, a jazz singer with multicultural background who has already worked with artists like Monday Michiru, Mondo Grosso or DJ Krush. Be sure to enjoy an eclectic and throughout melodic record with a perfect amalgamation of live musicians and modern productions that makes this album much more than just a collection of exciting tracks for the club dance floor. 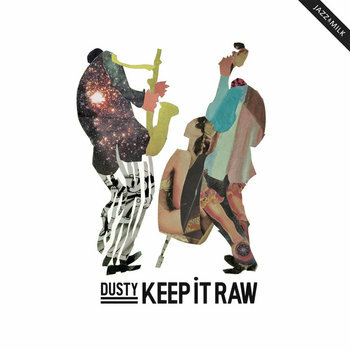 Influenced by a wide range of musical styles like Funk, Jazz, Afro and Latin, Dusty has created a unique sound that combines all of them extremely well. Tracks like “Rhythmo”, “Just An Illusion” or ”Keep It Raw” were already featured on compilations like “Brazilectro”, “This is DJ’s choice” on the Unique imprint, as well as Sony BMG’s “Kulturkantine – Contemporary Jazz Lounge Sessions”. The vinyl samplers of the album including an amazing remix EP (with remixes by Solo Moderna, Romanowski, Watch TV and Vono Box) got massive support from DJs and radio stations worldwide. More than three years ago Dusty has founded the label with his his first "Jazz&Milk EP" and since then has been releasing artists like Free The Robots, Mr Chop, Rube or Romanowski. While setting up a monthly labelnight in Munich and remixing acts like The Hi-Fly Orchestra, Analogik or Tom Eno, Dusty travels the world and fills club and festival dance floors with his exotic DJ sets that electrify with ambitious jazz melodies and heavy percussive beats. While the rhythmic elements and the basic groove of his productions deliver an impulsive club feeling, jazzy live solos add the right melodic dose to unite young and old music lovers or modern and vintage sound enthusiasts.